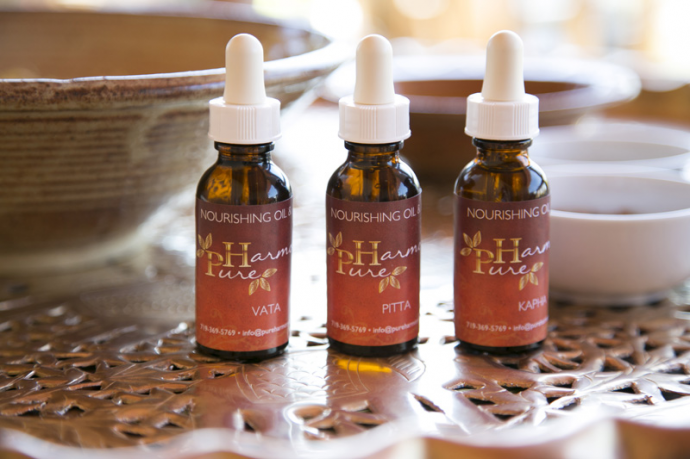 Pure Harmony nourishing oils are deeply penetrating to address skin problems at the source. Botanical nutrients help delay the signs of aging, increase cellular renewal, strengthen connective tissue and maintain proper moisture balance. The ultimate skin food to nourish and balance your skin. Restore moisture, tone and reduce the appearance of fine lines with sweet almond, borage, neroli and carrot seed. The reparative and soothing properties of rose, sandalwood and helichrysum bring balance and repair sensitive/combination skin. Hazelnut, rosemary, lavender and mint work together to reduce oiliness, tone, purify and decongest oily skin. Vata Nourishing Oil with Aloe - 1 oz. VATA- dry/dehydrated skin: Restore moisture, tone and reduce the appearance of fine lines with sw..
Pitta Nourishing Oil with Aloe - 1 oz. 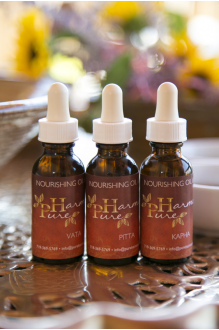 PITTA – sensitive/combination skin The reparative and soothing properties of rose, sandalwood and..
Kapha Nourishing Oil with Aloe - 1 oz. KAPHA – oily skin: Hazelnut, rosemary, lavender and mint work together to reduce oiliness, tone, ..